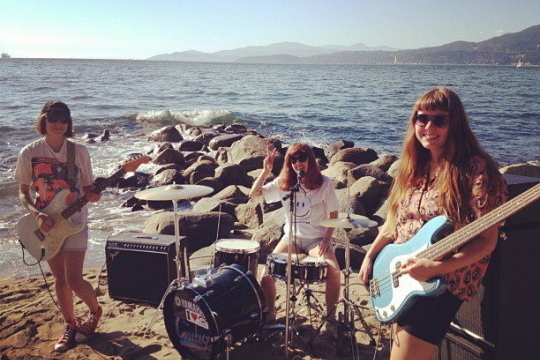 The Courtneys are a three piece girl group from Vancouver, Canada, who make summer drenched indie pop. Taking inspiration from Flying Nun darlings The Clean and 90’s alternative giants Dinosaur Jr., their self titled debut E.P. is a reminder of how infectiously fun indie can be when stripped back to the basics. Each track is concise and encourages us to look on the brighter side of life, and is achieved with a bubbling rhythm section that rattles in raw enthusiasm, and a jovial pulse of lo-fi guitar that never overstates its welcome. With each member contributing vocal talent and a lyricism that deals in financial self worth, innocent crushes on pizza delivery boys and Keanu Reeves, it’s easy to get windswept in the pleasure-seeking thrills these girls deliver. "Life is too short and The Courtneys fill each minute with a hunger for experience."